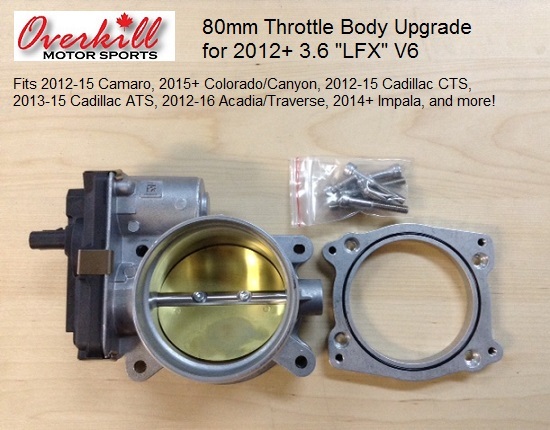 The only larger throttle body for the 2012+ LFX 3.6 is available here at JacFab, from Overkill. 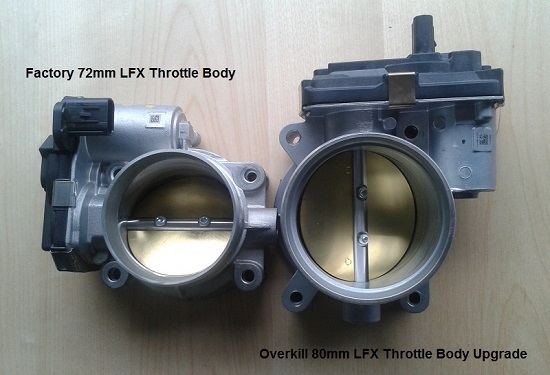 The factory throttle body is 72mm, as are ported units on the market. Our 80mm throttle body solution dwarfs the stock unit and will allow the your engine to breathe, improving horsepower, improving throttle response (particularly with Overkill tuning) and changes the intake note of the V6 to a deeper growl at heavy throttle. Requires no tuning, works best when used with a ported intake manifold, such as available from JacFab. Uses a brand new throttle body with an aluminum adapter plate and stainless steel bolts. Newest kits now come with an o-ring seal! Tip: This throttle body has a 3.5″ clamping area, compared to the factory throttle body of 3″. Ensure you have a solution available before installing the throttle body! Some research may be required to attach the throttle body to your air intake tube. Camaro specific applications for the couplers/elbows can be found above.